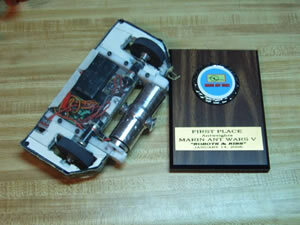 I went to Marin Ant Wars V yesterday and got first place in the antweight division. I went undefeated, thoroughly defeating (and destroying) some the best bots in the competition. We even saw a rainbow on the way back. After I got home, I laid down and got a full night’s sleep, which I haven’t got in 2 weeks. Yesterday was a good day. It was a lot of work making the robot.. er making Joe make the robot. He went to the event also with his robot Ground Clearance, getting fourth place (although would’ve done stronger if he hadn’t lost a judges decision in a match I thought he won. Oh well. Hopefully videos of the event will be up soon (on the MAW website) for those interested. I haven’t really done much the rest of my winter break though. I’ve been pretty lazy. My dad came into town over the break, and I visited with him and did the whole Chrismas thing. I worked with Joe on our robots for the event. I worked on Fortress Forever some, and did some consulting for a web site (i.e. making stuff and them paying me money for it, not really giving advice). School is starting next week so I have to prepare myself for that (ugh). Unfortunately, it’s got some of the classes I put off till the end because I don’t want to do them. I’m taking History (ugh! ), Spanish (double ugh! ), Stats (ugh! ), Senior Project (UGH!! ), and a computer graphics class (yay!). Hopefully I don’t get too sick of school this semester, and I pass all my classes.